As tensions are soaring in the South China Sea, China's BZK-005 surveillance drone has been spotted on Woody Island in the Paracel Archipelago, The Diplomat's editor Ankit Panda writes. Following a series of Pentagon military maneuvers in the South China Sea, Beijing has reportedly signaled its readiness to put an air defense identification zone (ADIZ) in place in the region. Before that, China's BZK-005 surveillance drone was spotted on Woody Island in the eastern Paracels. "Woody Island has been at the center of China's slow but sure bid to increase its power projection capabilities in the South China Sea. J-11 fighters have been long spotted on the island — the largest in the Paracels. Moreover, early this year, China's HQ-9 surface-to-air missile systems made an appearance on the island as well," journalist Ankit Panda wrote in his article for The Diplomat. Panda refers to new satellite imagery taken in early April 2016 and obtained by ImageSat International. The imagery allegedly shows a single Chinese Harbin BZK-005 long range reconnaissance drone sitting on China's Woody Island airstrip. "It's unclear if China has the requisite logistical support necessary to operate BZK-005 drones on a permanent basis from Woody Island. April's imagery showed a single drone sitting out in the open on the airstrip; the BZK-005 could have been on Woody Island for a unique patrol," the journalist suggests. He stresses that the BZK-005, a long range UAV designed by the Beijing University of Aeronautics & Astronautics, does not have the capability to fire missiles and is primarily intended for high altitude, long-range surveillance missions. First unveiled to the public back in 2006, the drone has a cruising speed of around 170 km/h and can stay aloft for 40 hours. It is also capable of taking ultra-high definition images. According to Panda, the imagery shows that Beijing is purportedly interested in boosting its intelligence, surveillance, and reconnaissance capabilities in the South China Sea. It is hardly surprising, given the Pentagon's recent pledge to beef up its military presence in the region. Indeed, Washington's assertive foreign policy toward the South China Sea maritime dispute, provocative FON (Freedom of Navigation) operations in the region, as well as the "Asian Pivot" strategy championed by Barack Obama and the Tran-Pacific Partnership (TPP) project have prompted serious concerns in Beijing. Furthermore, last month a Pentagon reconnaissance aircraft was intercepted by the Chinese military over the South China Sea. Following the incident, Beijing asked Washington to stop its surveillance missions near China's borders. 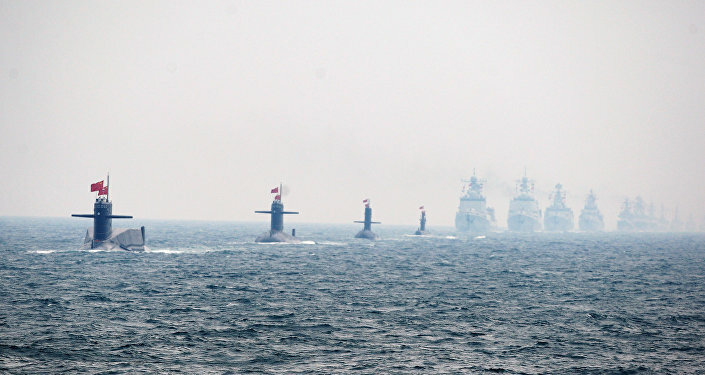 "If the US military keeps making provocative moves to challenge China's sovereignty in the region, it will give Beijing a good opportunity to declare an ADIZ in the South China Sea," a source in the People's Liberation Army said, as quoted by the South China Morning Post. However, in his recent interview with Sputnik, Russian military expert Viktor Baranets suggests that Beijing's potential missile defense "umbrella" in the region could spark a very serious conflict in the South China Sea. "This 'umbrella' is a serious step and I think that the US and its allies will not support the move. These actions might spark a serious conflict in the region very soon," Baranets told Sputnik. It should be noted that Beijing implemented its first ADIZ in the East China Sea in November 2013 to protect the Diaoyu/Senkaku Islands. The move predictably triggered a backlash from Washington, Seoul and Tokyo; Japan also has territorial claims over the islands.